The latter part of the Muromachi Era was a time of constant warfare. Prior to this time, the large Buddhist temples of the Nara and Kyoto areas controlled much of the military strength. The Yamato Tegai School (大和手搔) was one of the major sword producers of the Kamakura Era. They received their name because they prospered in front of the Tegai gate of the Todai-ji Temple in Nara. Due to the repeated conflicts of this Muromachi Era, the power of these temples weakened and the smiths lost their patronage causing their schools to fall into decline. The Kanabo School (金房) came into being during these declining times. The Tegai (手搔) smiths, Shinya Masanaga (新屋政長) and Fujiwara Masanaga (藤原政長) are thought to have founded the Kanabo (金房) School when they moved their center of sword production to the Kanabo (金房) area of Nara. We find the name, Kanabo (金房), appearing in their signatures as early as 1555. This gives us a good idea of the time frame for the establishment of this school. While Kanabo (金房) swords, particularly katana, are known for their somewhat inelegant shapes, they were, however, highly prized by Samurai of the Sengoku Era of constant warfare. This is because of their superior strength and cutting ability. 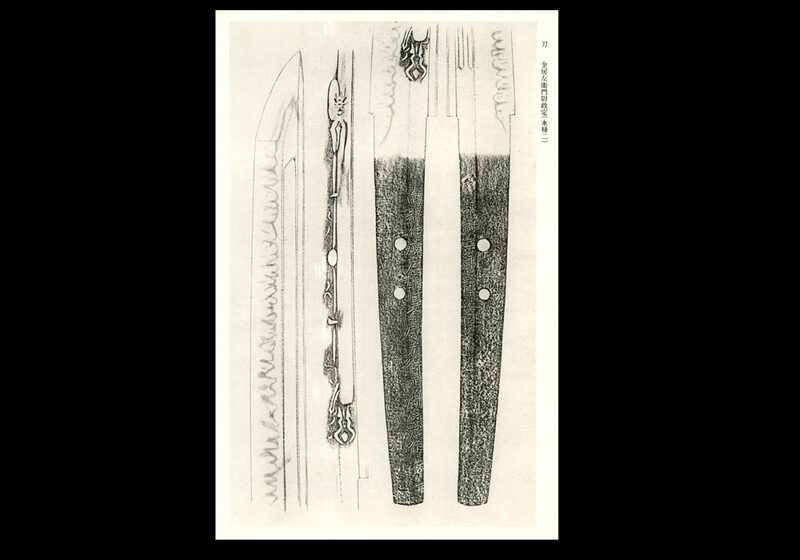 This helps to explain the existence of so many Kanabo (金房) blades today when compared with other swords that were produced in great numbers during this period of constant warfare. Simply put, they worked. They were made for combat and proved their capabilities. There are three generations of smiths from this school who used the name, Masatsugu (政長). The first generation is thought to have produced swords around the Tenbun Era (1532-1555). There are very few extant works by the first generation and his signature is very close to that of the second generation. The second generation, however, has left a large number of works of various types. The earliest dated work appears to be the third year of Genki (1573). The latest is the twentieth year of Tensho (1592). The third generation worked around the Keicho Era (1596-1615). Few extant works exist and no dated works have been found. SUGATA: Most katana are shinogi–zukuri and they typically have iori–mune. The blades tend to be wide and thick. The kissaki are long and wide. In general, most swords have a brusque, inelegant shape, which is typical of blades made for actual combat use. Other shapes of katana can also be found. 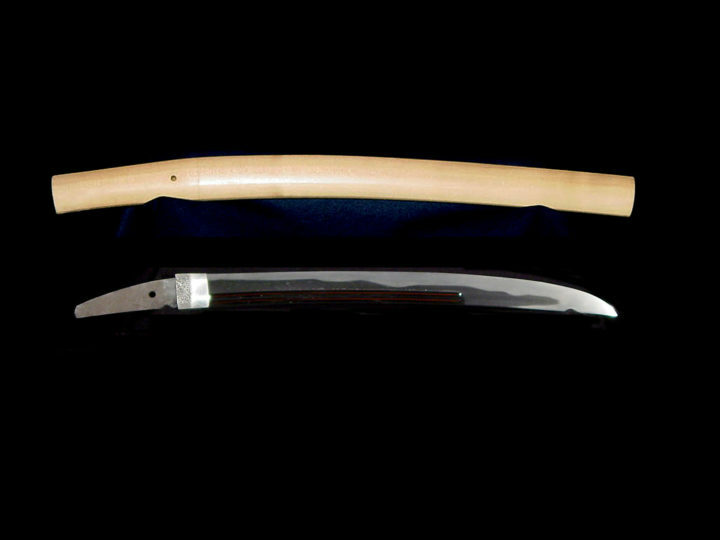 Hira–zukuri and moroha–zukuri tanto are rare, but there are a relatively large number of tanto of long length, which could also be called ko–wakizashi. They tend to be thin when it comes to their average width. There are large numbers of yari with a great number of them being of the jumonji–yari type. This is probably a result of the close ties between this school and the Hozo-in, a Temple specializing in yari combat. JITETSU: The kitae has a flowing feeling and will be either itame or mokume or a mixture of both. Also, masame will be found in areas. When ji–nie is found, it will tend to be uneven. The overall hada pattern will be prominent and somewhat coarse. HAMON: The yakihaba are wide. There are suguba with a mixing of ko–notare as well as shallow notare mixing with ko–midare. Often works of o–notare mixed with gunome–choji–midare will be found. The gunome hamon will usually have a mixing in of box shapes in which the base of the box is wider than the top so that the shoulders slant inward. Sometimes ara–ni, hotsure, and hakkake will be seen. The interior of the ha is highly active with ko–ashi and yo. The overall appearance of the gunome–choji hamon will be like the Bizen School. BÔSHI: There are some that are yaki–kuzure (the pattern is broken-up) and hakkake. Some are maru with a long kaeri. Also, ichimai bôshi will be found. HORIMONO: Compared to other smiths of the Yamato tradition, bo–hi and futatsuji–hi and such are plentiful. In general they are round-ended and stop before the machi. Other carvings include two suji–hi, gombashi, katana–hi, koshi–bi, and bonji. Rarely elaborate carvings of kurikara or Fudomyo–o can be found. NAKAGO: In general, the nakago–jiri are broad and ha–agari kurijiri. The yasuri are katte–sagari. I would like to acknowledge the fine research done on this school by Gordon Robson. He has done the definitive study of this school and this smith and I have plagiarized his work mercilessly in compiling this article. Thank you, Gordon.